← Let’s Party Like It’s 9/9/1999! Arsenio Hall is Back! Woo Woo! Not sure I got the phonetic spelling of Arsenio Hall’s trademark battle cry quite right (would it be Woo Woo? Woot Woot? Woof Woof? One of the world’s great mysteries. ), but does it even matter? All we really need is to shout from the rooftop that home boy is BACK on our late night TV! 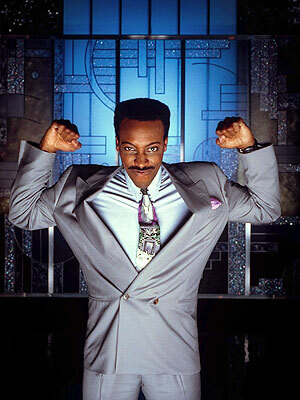 Nineteen years after The Arsenio Hall Show left the airwaves, it returned in all its glory last night in syndication. The thirteen-year-old in me is SQUEALING with joy-besides Studs, Arsenio was the show I most liked to watch while babysitting. I dreamed about being famous and sitting on that big comfy couch with the oh so modern geometric background. SO sophisticated. I was straight up jealous of Paula Abdul. And NOW I WILL GET MY CHANCE. Oh yes, God, I believe in you again, despite what might happen next week on Breaking Bad. Here is perhaps one of the most iconic scenes in the history of the show–and possibly in all of television–when Prez Clinton, then campaigning for the 1992 election, appeared as a guest and jammed on his saxophone. Enjoy! This entry was posted in Great Television and tagged Arsenio Hall. Bookmark the permalink.